In the Oak Cliff neighborhood of Dallas, Texas, there are two football teams that Food for the Soul provides pre-game meals for - The Sunset Bison and The JK Kimball Knights. We started feeding the Sunset Bison three years ago after we got a call from a local pastor who asked us if we could help feed a local football team that was hungry by providing them with some peanut butter and jelly. We said yes! During our first visit to the team, we gave each player peanut butter and jelly with a loaf of bread, and we included extra supplies for the coaches to give the team before practices. Before leaving, we asked the coach if the team had pre-game meals. The coach said, "Ms. Kim, they don't eat before practice, or even when they go home … No, they don't have pre-game meals. They're hungry." From that point on, we started bringing them pre-game meals, and we enrolled every player in our Backpack Program. These young men were so appreciative and joyful to just have food for practice. The coach told us that our generosity gave them hope that someone does care about them and their situations. Isaiah 58:10 teaches us, "if you spend yourself on behalf of the hungry and satisfy the needs of the oppressed, then the gloom will become like the noonday." Through the sharing of food with these precious children, we shine the light of Jesus into their darkness, bringing hope they may have never experienced before. It changes children and communities in ways that only God knows, and it blesses everyone involved in ways that God has planned in His sovereignty. With donations from our partners and The Gathering Church, we are able to feed The Sunset Bison team hot, nutritious meals before every game, and we even started a food pantry for them! 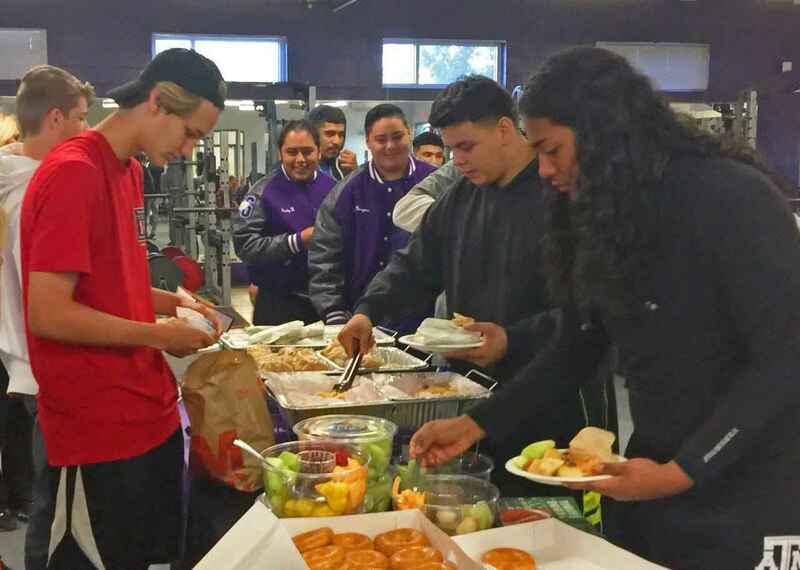 Then last year, we added another football team to our Pre-Game Meals Program - The JK Kimball Knights! In fact, The Way of Truth Church is feeding the Kimball Knight High School football teams. That brings the total number of athletes in our Pre-Game Meal Program to 220. The reason this program is so important is that high school athletes are in a particularly vulnerable and even dangerous situation when faced with food insecurity. Food fuels our bodies to function properly and is essential to overall health, muscle development, and performance. When student athletes miss meals, it affects their hormone levels, it robs them of energy, and can cause muscle loss. A high school athlete may come to practice and games hungry and tired, indicating dehydration and maturation. Because of the intensity of practice and games and the energy required to play, the lack of food presents a potentially dangerous situation for these kids. We know that good nutrition is extremely important as it provides the energy athletes need for optimal performance, and it helps to guard against injuries and improves recovery time. Therefore, Food for the Soul was happy to help these players get the food they needed. It costs $5 per football player per game for Food for the Soul to provide a hot meal. You can help us feed these amazing athletes. Make a donation today!